The slick Italian refuses to be moved by skill, beauty or bravery. Is Pirlo being cool or cold in this video? FEW PEOPLE ARE more beloved in the world of football today than Andrea Pirlo. Everything he touches turns to a shoulder-shrugging, nonchalant bit of magic. But this latest video from Juventus might be stretching the boundaries of Pirlo’s unperturbed attitude. They are trying to get #Pirloisnotimpressed trending so they have released this video of him being extremely statuesque in the face of a variety of talent and beauty. We all love the man for his cool manner as well as his football but he looks like a lobotomised character from One Flew Over The Cuckoo’s Nest here. It is a funny video but at the same time, there is a difference between being unimpressed and being a prat, and Pirlo is walking a very fine line here (You are seriously going to tell me that a renaissance man like Pirlo doesn’t like opera?!). Having said that, if any hashtag is going to replace #icebucketchallenge, I’m all for it. Sure, someone will catch pneumonia in this weather. 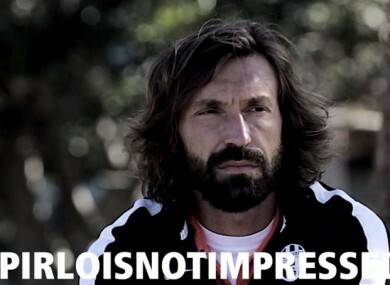 Do you love Pirlo’s unimpressed face or do you think he is becoming a caricature? Email “Andrea Pirlo is dangerously close to jumping the shark”. Feedback on “Andrea Pirlo is dangerously close to jumping the shark”.